So this is the result of running the flat 186_34-0 through xBR, then SFTGAN, then manually touching up mostly in the face and hair and cleaning up the edges. 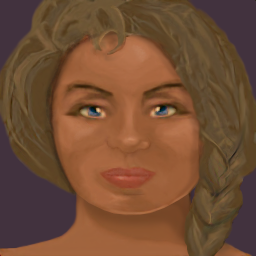 Since both ESRGAN and SFTGAN don't seem to be very well suited to upscaling faces in these cases, I reused the face from the attached portrait but modified it a little to make it match the source more closely. I think the results are good, although it is still pretty time consuming. But the more portraits that I get completed, the larger the pool of faces that can be used to fix the flawed portion of the ESRGAN and SFTGAN output, and the less time it will take overall. Reflections being on opposite side in each eye is a bit strange (and do not seem to match previous portraits). Is that a feature of this portrait, or AI taking too local decisions? Other than that I like the results; subtle touch ups. When the AI upscaled it, it messed up one of the eyes. I mirrored one eye to fix the other and forgot to go back and correct the light reflection. Nice catch! I'll fix it. Thats quite insane results! I think the portrait is different in the game... at least at the castle wayrest, but thats not important atm. Im quite surprised how well the AI did the breast area, thats top. The belly not so much, but not bad. Overall, its really good. Here is my sprite for comparison. Well, I got one MOB done. I decided to work on an enemy (Fighter Mage) that shows up pretty early in Privateer's Hold to make it easy to test in-game. I've gone ahead and packaged everything that I've gotten done so far (which isn't a whole lot) into a RAR file. 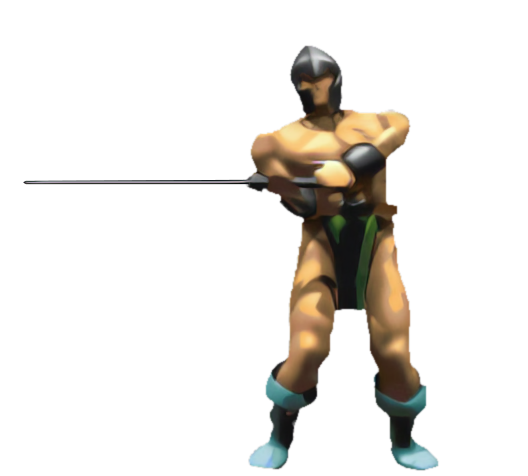 Just extract it into your DaggerfallUnity_Data/StreamingAssets/Textures folder and it should work. I used MrFlibble's technique to get cleaner edges, but it still requires quite a bit of work to get it right. MrFlibble and I could probably upscale most of the MOBs and other sprites pretty quickly, but I for one could use a hand cleaning up the output to properly restore the transparency. It isn't difficult, it's just tedious. @mason: I can also help You there. Just post a couple of sprites and I will try to do them in a batch manner if it can be done. Transparency? Its not used in Daggerfall sprites or textures. Oop! I misspoke. I meant help with the sprite alpha cutoff at the edge. In Gimp, I'm feathering out the selection when I cut out the background which gives me a few pixels of transparent "fluff" that helps to soften the edges a little, but it appears that DFU's shader is just doing a simple threshold alpha cutoff which makes the edges a little rougher, but it's no problem. I think it should be 2x the resolution IMO tho... I will try it. I'm going to continue to target a 4X upscale and we can downsample them after they're complete. I think many people would also prefer the 2X look. Pixel graphics have such a charm to them, don't they? I've attached an image comparing the original, 2X, and 4X versions for others' reference. Awesome! I've got to take my wife to a doctor's appointment at the moment, but I could try to get you some samples to work with so you can figure out a batching scheme. What color do you want the background to be? Any preference? As others have pointed out before, the AI seems to handle darker background colors a little better, but I don't know if it makes a huge difference.